Filé powder, also known as gumbo filé, is an herbal powder made from the dried and ground leaves of the sassafras tree (Sassafras albidum), native to eastern North America. The roots and bark of this same plant were the original base for root beer. It used to be frowned upon for human consumption because the plant contains a weak carcinogen called "safrole." 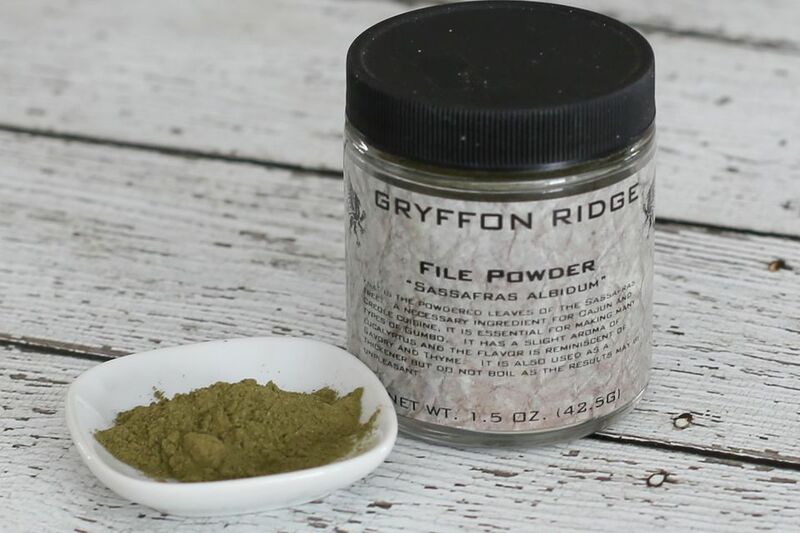 It's been determined that, while the roots and bark of sassafras contain significant amounts of safrole, the leaves do not contain enough safrole to even be detected by normal testing, and filé powder has been declared safe for human consumption. Powdered sassafras leaves were first used in cooking by the Choctaw Indians of the Southern U.S. When the Cajuns (Acadians) arrived in Southern Louisiana, they began using the spice as a thickener and flavoring in their soups, stews, and gumbos. Not all gumbo recipes call for filé powder, but a true "filé gumbo" should have both filé powder and okra. The word filé comes from the French "filer", which means "to spin threads." Indeed, filé powder, if added to the stew during cooking, does become thick and stringy and could ruin an otherwise delicious gumbo. It should be added to the gumbo off the heat just before serving, or serve it at the table for guests to sprinkle over their gumbo. You can find filé powder in most supermarkets and many specialty food stores. If not, check online food retailers.